Premium Stainless Steel Tea Infuser for Brewing Tea On-The-Go! Tea-lovers rejoice! 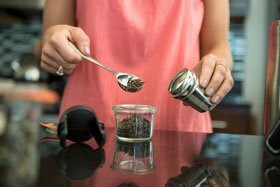 Contigo is now catering to tea-drinkers with a new removable Tea Infuser that fits in any AUTOSEAL West Loop mug for a convenient, on-the-go brewing solution. 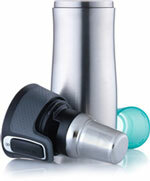 The stainless steel infuser will fit any West Loop travel mug. Its fine, etched holes ensure superior brewing and guarantee no tea leaves or dust escape into the brew. The infuser snaps securely into the blue drip cup for transporting once brewing is complete, and all accessory parts are top-rack dishwasher safe for easy cleaning. By using this Contigo product, you will both help the environment and also save money by taking your coffee, tea, water or juice with you in a reusable container instead of buying disposable cups or water bottles as you go. 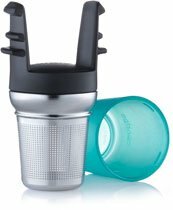 For easy care, the Contigo tea infuser basket as well as the cover and the drip cup are top-rack dishwasher safe. Always rinse the tea infuser, the cover, and the drip cup immediately after each use. Always store the parts separately to prevent moisture from becoming trapped in the infuser or drip cup after washing. We are proud of the quality materials and reliable workmanship that goes into each Contigo product. We go to great lengths to create a truly superior product, but we also know that on occasion, things happen. As such, we back our products with the Contigo Lifetime Guarantee against any manufacturing defects in materials and workmanship. 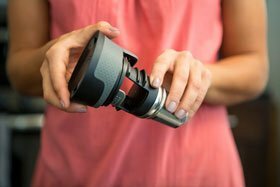 Knowing that on-the-go beverages can be messy and complicated to use, Contigo passionately engineered a line of simple yet functionally innovative drinkware to help people face life's daily challenges. The products are stylish yet resilient, and sleek yet strong – the perfect combination of performance and grace. Contigo products give you the confidence you need to face the day, and pride in knowing that you bought the best of the best. 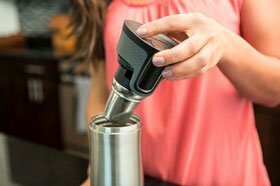 Contigo is passionate about the products they create and believes you will be pleasantly surprised by the array of helpful innovations it offers.